Evidence collection requires specialized procedures and protection. 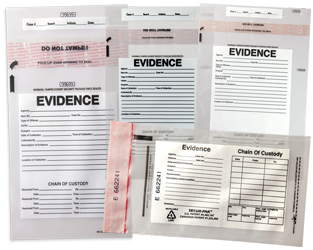 Secure-Pak manufactures security packaging in various sizes for many law enforcement agencies and distributors of forensic and criminologist supplies. Unique sequential numbering on the body of the bag as well as the adhesive liner to prevent "bag switching" and to establish an "audit trail." (The number should be recorded and listed on investigative documents). Bar coding also available. Special side seals to discourage tampering. Writable areas on the bag insure identification and reference. SECUR-PAK’s patented, pre-mounted, self-sealing, SECUR-TAPE which utilizes our unique, breakaway serrated edge. SECUR-TAPE is tamper-evident even against externally applied heat or cold (i.e. canned FREON), making attempts to compromise the bag using these methods obvious upon examination.